The following information is by the National Stroke Association. Nearly 800,000 people in the U.S. experience a stroke each year, and someone dies from stroke every four minutes. 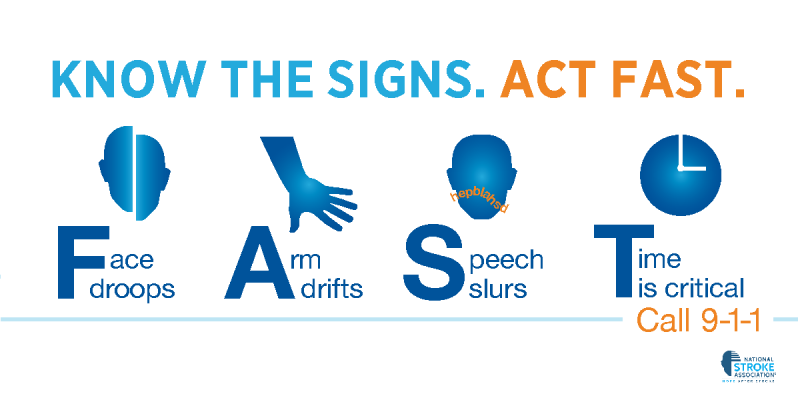 Knowing the signs of stroke, how to prevent it, and how to help others around you, just might save a life. A stroke is basically a “brain attack” that occurs when blood flow to the brain is interrupted by a blood clot or broken blood vessel. On average, every 40 seconds someone in the U.S. as a stroke and about 800,000 people will be affected each year. For 7 million stroke survivors throughout the United States, receiving the appropriate education and care is essential to their recovery. A stroke can happen to anyone at any time! A common fallacy is that only “old people have strokes.” That simply isn’t the case; a stroke can happen to anyone at any age, regardless of physical shape, race or gender. The National Stroke Association offers largely free education, resources, services and legislative advocacy focused on the needs of stroke survivors, caregivers and healthcare professionals in the stroke community nationwide. They provide services to about 90,000 stroke survivors, 30,000 caregivers, and more than 110,000 healthcare professionals in the U.S. and Canada; and the number is growing every day. To learn more about recognizing and prevents stroke go to the National Stroke Association website.